Regardless of what theory any given mason or lodge accepts as to the origin of freemasonry the goals of promoting self and community awareness and the goal of becoming better men and exploring the mysteries of life is common to all masons and masonic organizations. Much of our teachings are allegorical (symbolic), stories based on the building of King Solomon's Temple . The Grand Lodge of the State of New York was formed in 1781. June 13, 1856 and has been in consistent practice since then. The Lodge is a Fraternal order of men dedicated to their lodge and their community. Masonry is not a religion, and men of all types of faith are welcome. However, every masons must declare his belief in a supreme being, also referred to as the supreme architect of the world, as well as the immortality of the soul. Freemasonry is ofter called the worlds oldest fraternity There are a number of theories as to the origin of the fraternity. 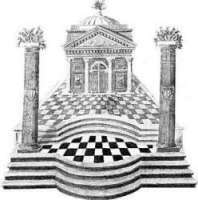 Many freemasons accept the theory that the fraternity began with the stone masons guild in England around the 1600's. There are others that believe the masons of today grew from these beginnings and that operative masons (actual stone workers and builders) accepted new men from all different trades and backgrounds. The non-builders were referred to as speculative masons . There are some who believe that the stone mason guilds, provided a blueprint for the rituals and teaching of todays speculative lodges,but that the rules and rituals for the lodge were invented by men of the time as place of some secrecy to get away from the poltical and religous strife that was prevalent during that period of history. These early lodges banned any discussion of religion and politics in the lodge ( which still hold true today) . Many take this as proof or their motivation to have a place to meet as brothers and equals regardless of religious or political beliefs. 1. Benjamin Franklin was made a Mason in Tun's Tavern Lodge in Philadelphia in 1731 ( Tun's Tavern was also the place that the United States Marine Corps was brought into being). 2. Many leaders of the American Revolution, including President George Washington were Free Masons. 3. Masonry made it to the American Colonies in 1731 with the first raising of a Free Masonry lodge in Philadelphia. 4. The Ancient Arabic Order of the Mystic Shrine, also commonly know as Shriners is a related body of Masons.